Maintain and improve your health? Manage a chronic health condition? Manage changing health conditions due to aging? Recover quicker from an injury? Prepare for, or recover faster from, a medical procedure? The flow of living energy, or Ki, is strong in a healthy body. By unifying mind and body, we can use the techniques of Kiatsu to maintain that flow, or restore it when the body becomes weakened due to illness, injury, or overuse. Kiatsu is a method of widespread application in helping us live a happy, healthy life. Begin by calming your mind so Ki flows freely though you. Then place your fingertips, or thumb tips, on a particular area of the body without pressing hard or putting strength in your own hands. After a short time, the body's own healing process becomes activated. As you proceed, there is no need to massage, no need to do anything but maintain contact with your fingertips and continue to concentrate on the flow of Ki. What Happens In a Kiatsu Class? Classes generally last two hours. In the first hour, you perform simple activities with a partner to learn how to calm your mind so Ki flows. This is quite similar to Ki Development class. 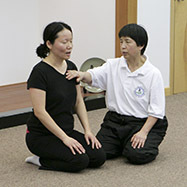 In the second hour, you take turns practicing Kiatsu with a partner of your choosing. Because of the small class size, you will get direct assistance from the instructor whenever needed. You may start your study of Kiatsu at any time. Your first several classes will be treated as an introduction. Wear a cotton T-shirt, warm-up pants, and socks. Feel free to bring a notebook and pen to take notes. Students who wish to pursue Kiatsu training enroll in the Personal Kiatsu School. Enrollment is limited to persons age 21 or older.